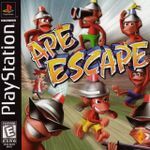 The first game designed solely for use with the analog controller, APE ESCAPE takes you on a crazy adventure through time and space to stop mokeys taking over the world. Over 20 true 3D levels. Bonus mini games including Monkey Boxing and ski racing! Each monkey has an individual name, personality and skill level that affect gameplay. Training rooms and 3 bonus games. Loads of gadgets and tools to collect throughout the game, including a slingshot, monkey net, sky-flying propellor, radio controlled car and rowing boat.